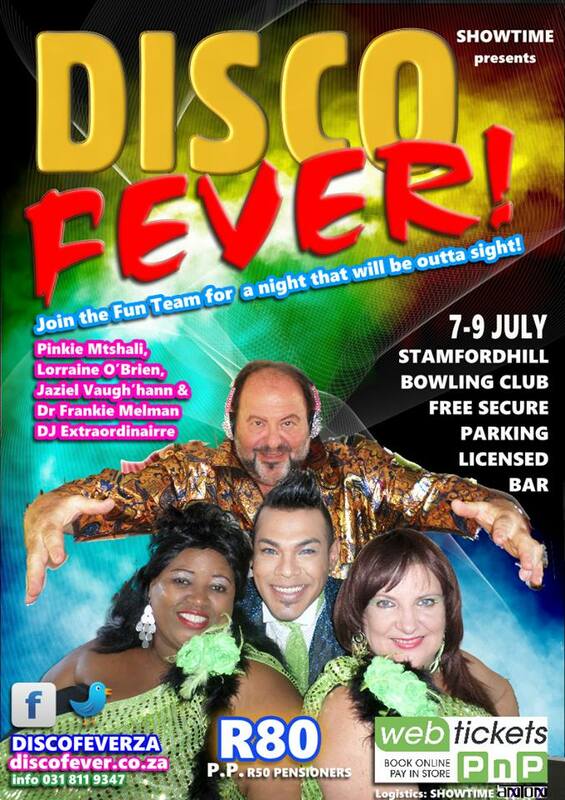 Grab your diary and save the dates of July 7, 8 and 9 for a groovy night out at the Stamford Hill Bowling Club with Disco Fever, which promises an out of this world disco experience brought to life on stage by Durban’s top performers. Disco Fever is a brand new and original cabaret offering. It has taken over 40 years for radio broadcasts from Earth to reach the inhabitants of the furthest galaxy in the universe known as Far Out and they immediately fall head over heels for the groovy tunes and set their course for Earth, but soon after landing, they realize that they have been shucked because of delayed radio signals due to our square primitive frequencies. To make matters worse, their intergalactic starship, Gertrude, had encountered engine problems on its way to Earth and needs repairing. Luckily for them, they meet one of the best loved DJ’s of the 70s who might be able to come to their aid. Featuring a stellar cast consisting of Pinkie Mtshali, Lorraine O’Brien, Jaziel Vaugh’hann and Frankie Melman they will present a hit parade of dance floor favourites that includes I Am So Excited, It’s Raining Men, YMCA, Hot Stuff, I Love The Night Live, Take A Chance and many more. “Don’t be a closet disco queen, come join us for a tubular night out as we welcome you to dress up in your most twitchin’ disco-inspired outfit or accessories,” says the cast. Shows take place on July 7, 8 and 9 at the Stamford Hill Bowling Club, 5 Arbuckle Road in Durban. Tickets R80 available through webtickets.co.za. on the Friday and Saturday, doors open at 19h00 and the show will start at 20h00 (13h30 for the matinee on Sunday). There is secure parking, a licensed bar and kitchen. For more information contact 031 811 9347.